This is Seattle’s second oldest neighborhood and was rebuilt after the great fire of 1889 that leveled 33 square blocks of the city. In 1897 the Klondike Gold Rush started in Seattle, and the city became the central hub for supplying miners. When the Denny party landed in 1851 on what we now call Alki Beach, they discovered the high winds and long winters were best avoided by moving to what we now call the Pioneer Square area. As the area grew, the first village called itself “Duwamps” in honor of the Duwamish Indian tribe who’s village was located where the current train station is. In 1852 Henry Yesler chose this area as the site for Puget Sounds first steam-powered sawmill, right on the corner of today’s First and Yesler, thus boosting the fortunes of the area. Yesler Way became known as Skid Road as he would drag his logs down the muddy path from the East to his sawmill. Eventually,”. the area south of Yesler Way became known as Skid Row in the 1930’s during the Great Depression. Here about a 1,000 men lived in about 600 “Shanti.” These were roughly built, often ramshackle cabins or shacks made from whatever material could be scavenged. On June 6, 1889 the Great Seattle Fire began when an overheated glue pot caught some turpentine soaked wood shavings on fire in a cabinet shop at First Avenue and Madison. If there was any reasonable time to have a fire, then this was it, and the city could not have burned at a better time, all 33 square blocks of it. The fire wiped the slate clean and allowed the city to rebuild itself as a modern urban center. The rebuilding process required that all new buildings be built of brick or stone and city planners also elevated the flood-prone streets a full story, causing some buildings to have floors underground. Today you can walk down the sidewalks of Pioneer Square and see purple colored glass prisms in the sidewalks. These allowed the stores to operate, creating some natural light to the stores below the street. Initially these were clear prisms, but UV rays have changed them to purple. If you’d like to explore the underground portion of the city, then take our favorite Seattle underground tour, Beneath the Streets Tour. 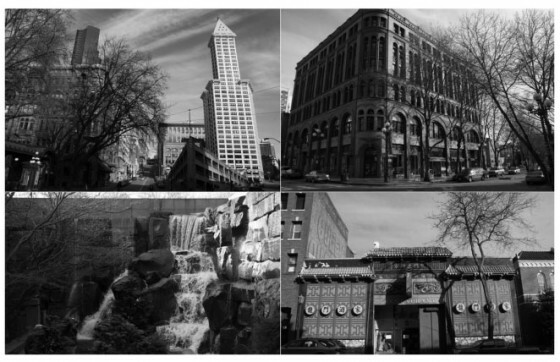 Today Pioneer Square is a busy area of activity from restaurants, to art galleries to the central location to celebrate our local sports teams when they play at the stadiums south of the area. With the rich history and culture, you’re sure to find something of interest here. Below are just a few suggestions for you on your visit to this area. Flury and Company – One of the largest collections of vintage photographs by Edward Curtis, along with Native American antiques, traditional carvings, baskets, masks, jewelry, and tools are showcased in a historic space that’s as interesting as the store’s wares. Foster and White Gallery – A century-old building with high ceilings and 7,000 square feet of exhibition space. Works by internationally acclaimed Northwest masters Kenneth Callahan, Mark Tobey, Alden Mason, and George Tsutakawa are on permanent display. Glass House Studios – Glasshouse Studio is the oldest blown-glass studio in the Northwest. Founded in 1972, the studio holds regular demonstrations as well as weekly group tours. Klondike Gold Rush Museum – This is one of our favorite museums in the city. Walls are lined with photos of gold miners, explorers, and the hopeful families who followed them. Film presentations, gold-panning demonstrations (daily in summer, at 10 and 3), and rotating exhibits are scheduled throughout the year. Wing Luke Museum – The only museum in the U.S. devoted to the Asian Pacific American experience. The museum includes re-creations of typical early-20th-century one-room apartments, a communal kitchen, and the Yick Fung Company store. Man Made Waterfall at the original location of the United Parcel Service offices. UPS started in Seattle in 1907 as the American Messenger Service. This entry was posted in Seattle Info and tagged Lunch, Pioneer Place, Pioneer Square, Restaurants, Seattle, Seattle underground tour, Things to do in Seattle. Bookmark the permalink.